I hate it. I hate how teachers circle wrong answers in red. I hate how red grabs attention. I hate how it is the color of the store I used to work at. I hate how it was the color of my high school’s mascot. I hate how it is the color of the one cupcake that haunts my dreams. Red velvet, everything about the name is so suggestive. It just screams love, lust and desire, but to me it taunts me with an F marked in red pen. Red velvet cupcakes and I have a past. They are my one culinary failure, the one cupcake I could not serve, the one thing I have ever been ashamed of. 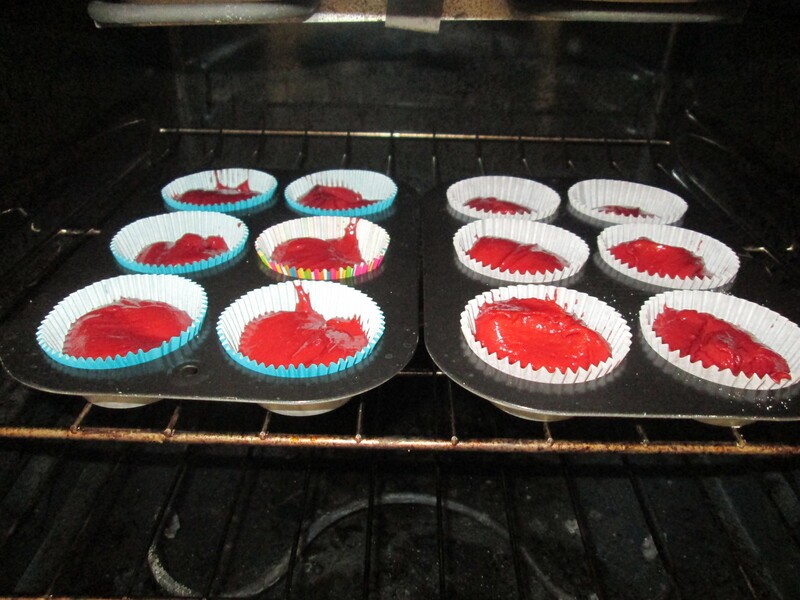 The first time I attempted them nothing worked out right, the red was wrong, the batter was too soupy and the cupcake wrappers were wrong. Yes, I have a thing about cupcake wrappers, and the only ones I had left at the time did not match the cupcakes, it drove me crazy. I was sitting at work on Monday and was thinking it was time for redemption. A girl I work with is obsessed with red velvet cake, and I asked her what she liked about it so much. “The color, duh.” I asked a girl who wants to be a kindergarten teacher, I should have known better. The one thing I can’t stand, is the one thing she likes the most. She went on to explain it was the icing that made it, the perfect contrast of a light chocolate cake and super sweet cream cheese. I went for it, took an idea and dove in. I took the recipe I had and threw it out the window (quite literally in fact). 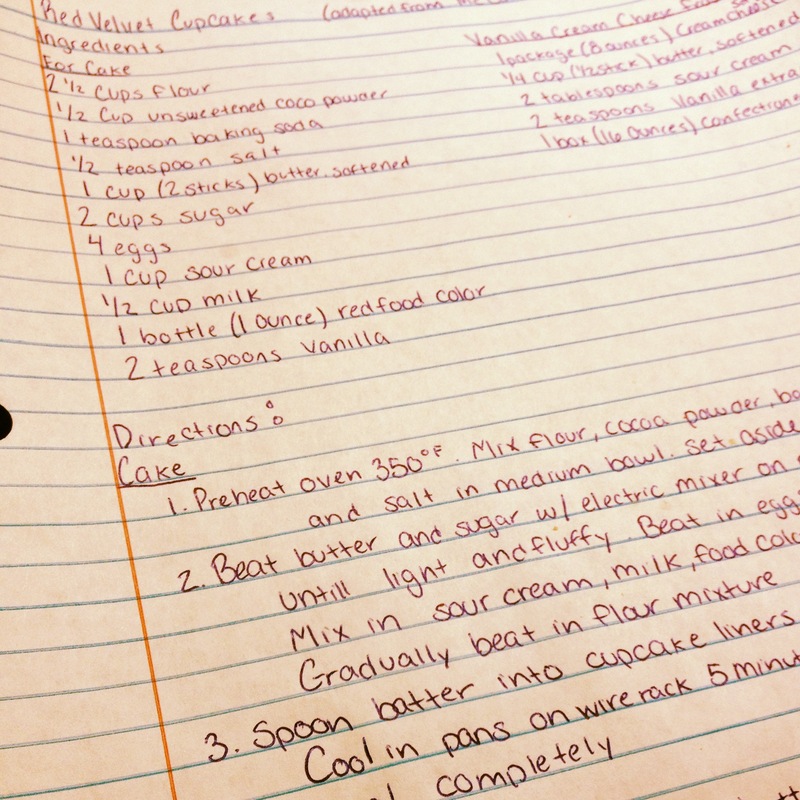 I started from scratch with a wonderful cream cheese frosting recipe my mom had and went from there. The results shocked and surprised me. After I made the batter I tasted it, my friend once said that a good tasting batter leads to a good tasting product, it also gives her an excuse to eat my unbaked goods, but the batter was good. I knew these cupcakes were going to be the best red velvet anything I ever made. And they were, everyone agrees. 1 Package (8 ounces) cream cheese, at room temp. Preheat oven to 350*F. Mix flour, cocoa powder, baking soda and salt in medium bowl and set aside. Spoon batter into cupcake liners, about 3/4 full. Bake 20 minutes. Cool in pans on wire rack for 5 minutes, remove from pans and cool completely before frosting. Beat cream cheese, 1/4 cup butter, 2 tablespoon, sour cream and 2 tablespoons vanilla extract until light and fluffy. Gradually beat in 16 ounces confectioner sugar. Lol, you and red don’t always get along, do you? Red velvet isn’t my favourite, simply because it’s hard to get right. It needs to be super moist, with that right balance in flavour that isn’t quite chocolatey and instead, is difficult to put one’s finger on. 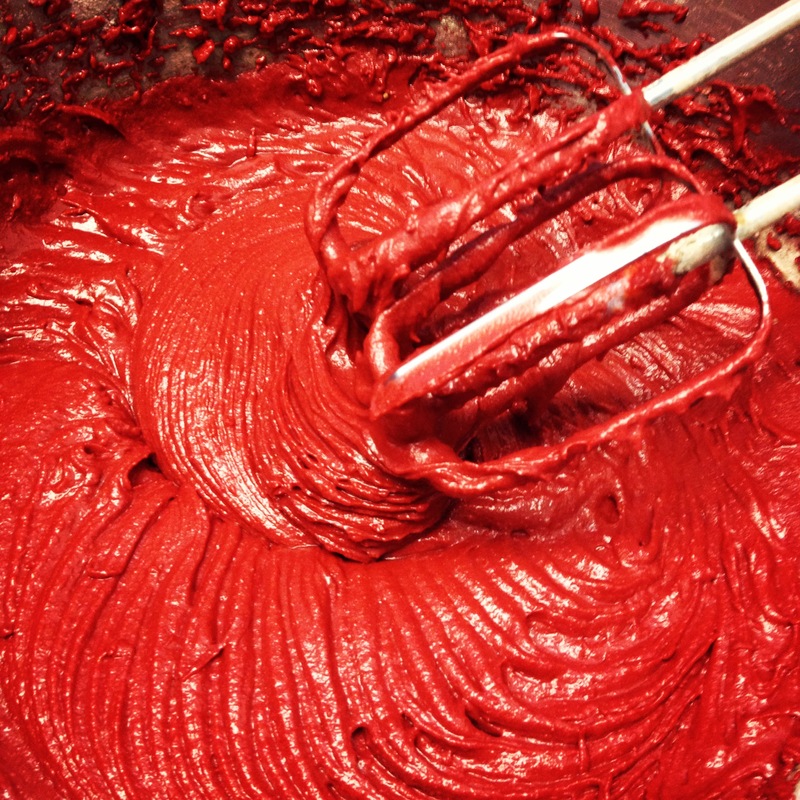 When red velvet IS done right though – yum! 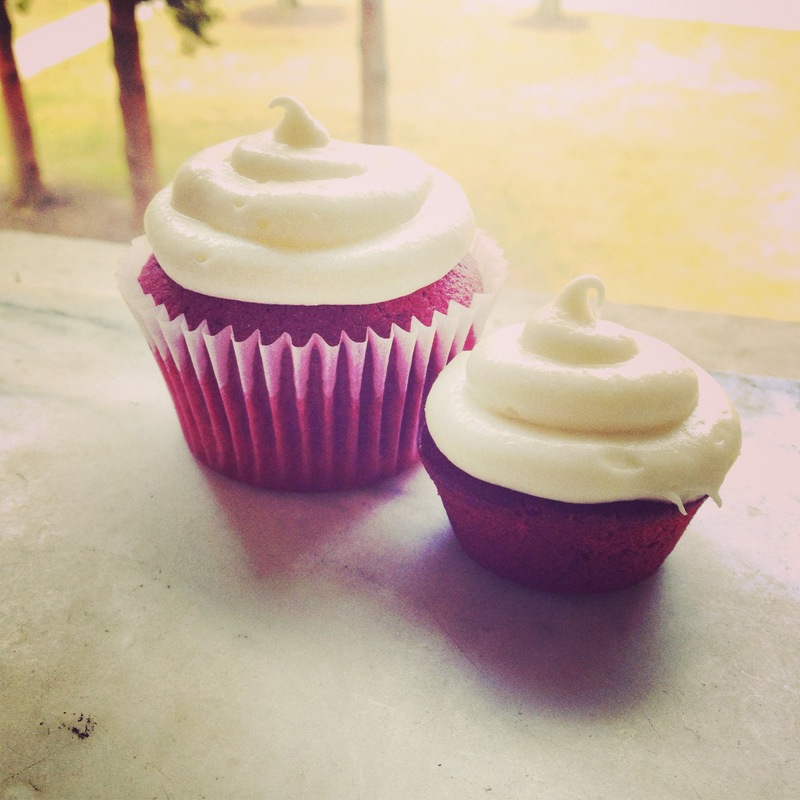 Your cupcakes look beautiful – I’m drooling over that perfectly piped, thick, luscious cream cheese icing!